Do everything you can to get a troop cross the touchdown line at the end of the Arena. Troops will run in straight lines until get lured. 1 troop crossing the line = 1 Crown. Get 3 Crowns first to win the game. Otherwise, the one who gets more Crowns in 3 minute will win the game. There will be sudden death also. x1 Elixir and x2 Elixir phrases remain. The first 2 minutes are x1 Elixir and the rest is x2 Elixir. There is also sudden death phrase. Cards like Graveyard, Miner, Goblin Barrel etc cannot be placed past the middle. This game mode is very different to what we usually play. Cards that are good in normal games might not exactly be that useful in this mode. Spells aren’t as effective in this Touchdown, the Tower damage doesn’t exist here and spawners are finally overpowered! It’s chaotic here and almost a completely new meta. I cannot stress this enough. Having the right buildings in Touchdown would give you tons of advantages. Mortar and X-Bow are probably one of the top picks. I recommend cards like Furnace, Goblin Hut, Barbarian Hut etc as well because they are good at defending as well as exerting pressure because each Fire Spirits, skeleton, Goblin or Barb that spawns has the potential to cross the Touchdown! You can drop a spawner and pressure the other side of the arena while the spawner continuously sends wave after wave and distract them allowing your spawner to send something over the line! Try to avoid spells like Clone, Heal, Lightning etc. While good in regular play they aren’t the best in this in my honest opinion. You ideally want to have spells that can get value as loads of troops will be bunched together, each will have it’s moments where the spell shines and where it does not. Pick at least one of these If you have the chance! Have good air and ground DPS! You will need cards that can take down cards like Golem, Lava Hound etc while only being able to place cards in a limited region. Cards like P.E.K.K.A aren’t that great in this mode because of just how many swarms there are and chances are you may not have cards like Log/Zap etc to remove swarms. Princess is one of the best cards in this mode. She is excellent to bait out cards and spells. Dart Goblin is also really good at controlling a really large radius. As for crowd control, Executioner, Wizard, Bowler etc are very good at filling this spot. Valk post buff is also a really good troop in this spot. Using these cards at the last seconds of the match is one of the most satisfying things. For sure. Make sure you have already had at least one building-targeting troop to make the most of them. In this game mode, everything is a win condition and ought to be treated that way. Battle Ram is a must-pick. It is fast, targets only buildings and spawns Barbarians that could potentially be in the touchdown. 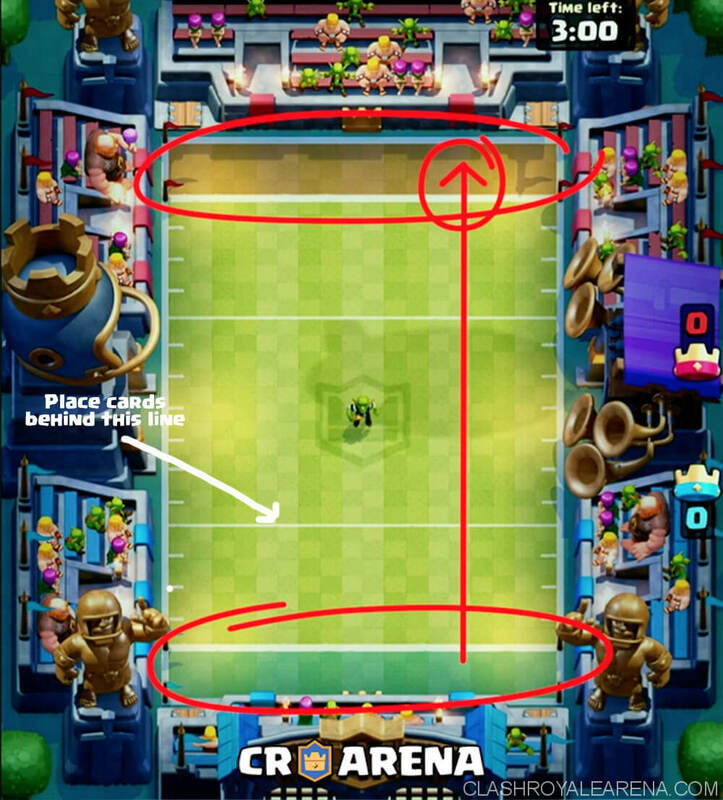 If your opponent just spent all of their Elixir and you play a Ram in the opposite lane, it is nearly impossible to stop it from scoring if supported correctly. Hog Rider (Currently removed) – Automatically pick Hog Rider as this is the Hogdown Mode!!!! Mini P.E.K.K.A and P.E.K.K.A need 2 hits to kill him. Paired up with a well timed Rage this can equal an easy point. Balloon – The Balloon is insane in this mode. This card is really strong if you have a tank, similar to Lavaloon, Golem, Giant etc in front, making it a very deadly card for your opponents to deal with as they do not always have air-targeting cards in hand. They are perfectly capable of crushing big tanks then charge at your opponent’s defenses. Also, due to the exclusive skin, just pick them. Spawner puts on constant pressure which requires a response for the whole match. Builds up massive Elixir advantages while pulling Hogs and Rams. Barbarian Hut isn’t as great as the other 3 because of the Barbarians’ sluggish move speed but it still offers a lot of value. Golem – This bad boy has a ton of HP that your opponent has to deal with and tanks for whatever is behind him. Playing him early isn’t that huge of an issue because getting rushed really isn’t that much of a threat in 2v2. The Golemites are usually the MVPs in Golem games because dealing with the Golem and the almost 1000 HP Golemites is just so annoying. Mega Knight – Fast, splashes, has tons of health, has spawn damage to kill stuff before counter pushing. Lots of value. Although not a must, he is a very good addition to a potential huge push. Poses a threat by himself, too but he is easily distracted and because of the nature of draft this pick can either be rather good for you, or actually pretty useless. Lava Hound – He is just so good in this mode because of the Lava Pups. The most interesting part is that when it pops out, there are chances that your Lava Pups hit the touchdown. They spawn fast moving units which deal a lot of damage and require responses. Lumberjack – He himself is a fast moving threat and after he dies, the Rage can be very very threatening especially if you have a Hog, Balloon etc following him. Or even a Battle Ram. These will speed up and chances are they will manage to make it across the line quite easily. Their very long range makes them very effective in Touchdown. Just drop them at the very front and watch it snipe a damaged Minion Horde, killing them all in no time. Also not all the time your opponents have The Log so they are just so good here.